The OpenID-based commenting feature on Blogger is no longer in Draft. 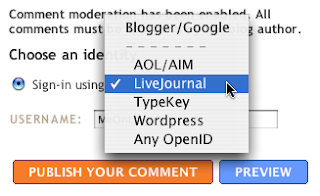 Now, OpenID commenting is available for all Blogger blogs. Blogger has chosen a few popular OpenID providers to highlight on the comments form such as WordPress.com, LiveJournal, and AOL/AIM, but it's also possible to use any OpenID service (e.g. myOpenID, Verisign, or OpenID.org or any other service that implements OpenID) to post a comment by choosing "Any OpenID" and filling in your OpenID URL. A list of interesting posts/links related to OpenID is available here.